We offer grain-free formulas to our SAVOR line-up to deliver the important benefits you want without the ingredients you don’t. Real chicken or turkey is the number one ingredient. 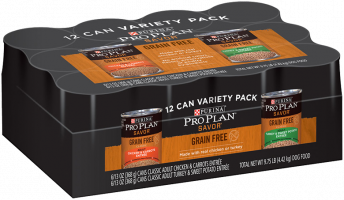 It's the outstanding nutrition of Pro Plan with exceptional taste your dog will love. 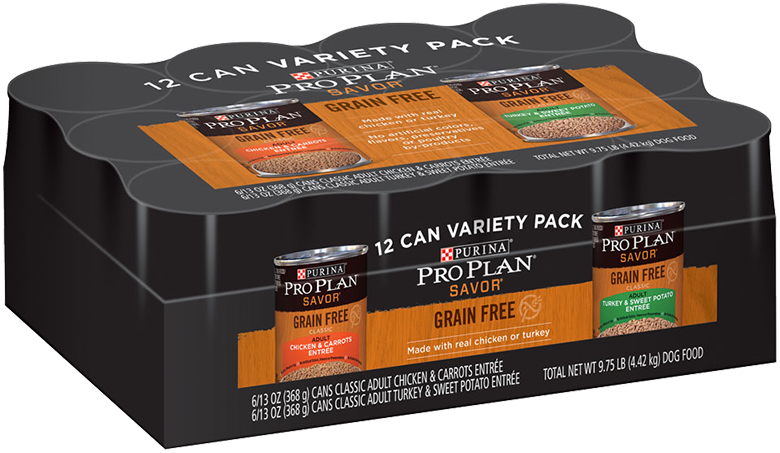 Variety pack includes 6 cans Savor Grain Free Adult Classic Chicken & Carrots Entrée and 6 cans Savor Grain Free Adult Classic Turkey & Sweet Potato Entrée. 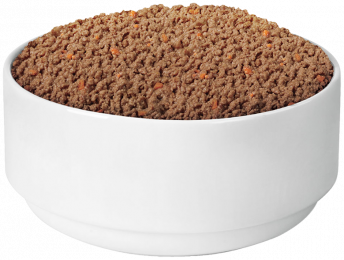 Grain Free Adult Classic Chicken & Carrots Entrée: Chicken, Water Sufficient for Processing, Liver, Meat By-Products, Carrots, Guar Gum, Potassium Chloride, Salt, Carrageenan, Calcium Carbonate, Vitamin E Supplement, Zinc Sulfate, Ferrous Sulfate, Choline Chloride, Niacin, Thiamine Mononitrate, Copper Sulfate, Calcium Pantothenate, Manganese Sulfate, Pyridoxine Hydrochloride, Vitamin B-12 Supplement, Riboflavin Supplement, Vitamin A Supplement, Folic Acid, Vitamin D-3 Supplement, Biotin, Potassium Iodide, Sodium Selenite. C-4371. Grain Free Adult Classic Turkey & Sweet Potato Entrée: Turkey, Water Sufficient For Processing, Liver, Meat By-Products, Chicken, Sweet Potatoes, Guar Gum, Potassium Chloride, Salt, Carrageenan, Calcium Carbonate, Vitamin E Supplement, Zinc Sulfate, Ferrous Sulfate, Choline Chloride, Niacin, Thiamine Mononitrate, Copper Sulfate, Calcium Pantothenate, Manganese Sulfate, Pyridoxine Hydrochloride, Vitamin B-12 Supplement, Riboflavin Supplement, Vitamin A Supplement, Folic Acid, Vitamin D-3 Supplement, Biotin, Potassium Iodide, Sodium Selenite. C-4372. Pro Plan Savor Grain Free Adult Classic Turkey & Sweet Potato Entrée is formulated to meet the nutritional levels established by the AAFCO Dog Food Nutrient Profiles for maintenance of adult dogs.